Raymond Rosetta and his wife Phyllis (née Coriz) are a Santo Domingo Pueblo couple who make inlay jewelry, earrings and a host of handmade offerings. Phyllis is Gilbert "Dino" Garcia's sister. 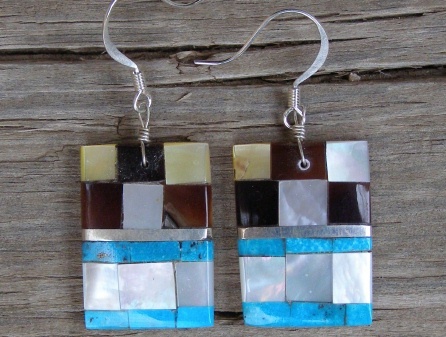 These mosaic earrings are inlaid with individually hand-cut tiles of stone and shell with a band of Sterling silver channel inlay on a foundation of melon shell. On Sterling wire and hooks. Size of each earring: 1" x 3/4"